We do, all the time. Anywhere you need & want us, we will try our best to get there. Our work takes us all over the world. We usually arrive to meet you one or two days before the wedding. We can use this time to get to know you, see the venue or use the time for a quick session or film your story more in depth. For destination weddings we charge some travel & lodging fees. When you book us, upon signing the contract, you are required to pay the booking deposit. The rest of the payment has to be done in any time before the wedding, as you see ﬁt or on the day of the wedding. Accepted are credit cards and Paypal. VAT is charged upon booking. Yes. We always have multiple camera bodies, a number of lenses, and more memory cards than we need at all weddings. We film & shoot on Canon 5D Mk3 & C100, Sony A7S but also offer 16MM filming as an extra. DO YOU HAVE A BACKUP VIDEOGRAPHER? We do. In case of higher force of nature, If either of us can’t make it for some reason, we have additional videographers that have worked with us in the past and always delivered same stunning footage. All our work is edited by me. We work on a first come, first serve basis, once the deposit is paid your wedding date is firmly secured. Sadly we cannot hold dates for you without booking deposit and signing the contract. DO YOU ONLY CREATE SHORT FILMS LIKE THE ONES ON YOUR WEBSITE? No, the films on our website and Vimeo are just trailers or our Preview movies. The focus of our work are our beautiful Highlight and Feature Films, which are usually 10, 15 or 20+ minutes long. Once you send us an inquiry, we will get back to you with all the information on available packages and pricing. Depends on your choice, either by download or on wooden USB ﬂash drives in unique handcrafted Postcard boxes which can hold your films. Some packages already include the boxes. 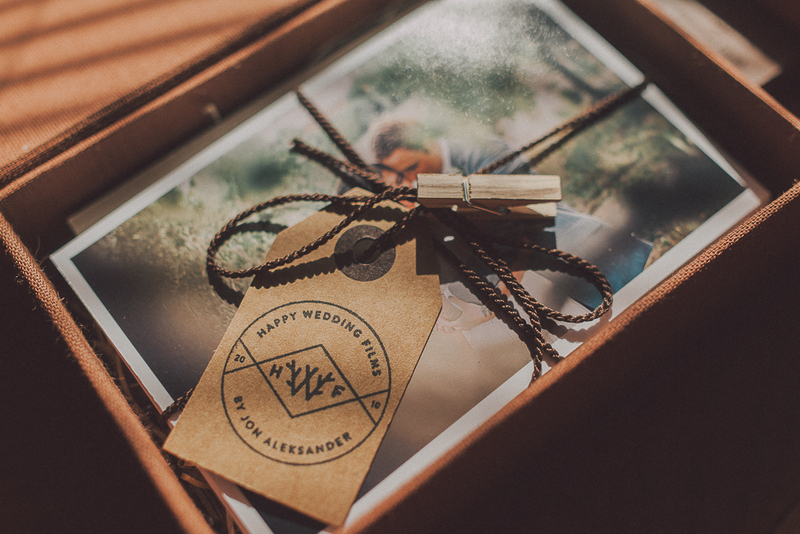 We always include a couple of our analog fine prints, and the boxes can hold the USB drive with your uncut/RAW footage as well. You can also receive your footage via WeTransfer. Usually it takes us up to 5 months to get your films ready and shipped, but this can happen sooner. Trailers are done within a month after the wedding. The last thing I would want to do is rush over your wedding, just to get it done by the deadline. The memories we craft will be there for you in the years to come and if we need more time to create something beautiful for you, I see no reason not to take that extra time. Delivery dates change depending on low / high season. If for whatever reason, you need your film sooner, do let us know and we will see if it is possible. Contact us and we’ll send you our pricing.